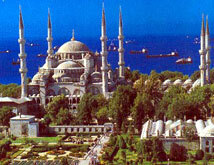 Blue Mosque, Sultan Ahmet Camii is one of the most beautiful mosques in the world. Its name is derived from the blue tiles decorating its interior. Completed in 1616 by Mehmet Aga, Imperial Architect and one of the students of the great architect Sinan. Iznik tiles on the walls are bathed in glorious light that is filtered through 260 windows. On summer evenings there are light and sound shows in the grounds.